Welcome to the falconcamp in Schwangau! In a very beautiful surrounding we provide space for 1000 people on our campsite (only tents allowed) and about 80 simple beds inside the building throughout the whole year. You’ve got a gorgeous panorama to the Alps and the castles which are only about one mile away! If you wanna stay in our guesthouse, you've got to be a group more than 25 persons(april-september) in summer an 50 Persons in Winter (october-march). We don't provide breakfast or full board. Caravans, mobilhomes and dogs are not allowed on our campsite. Only for Groups, not for individual camper. Groups pleas contakt us by email. Come to the “Falconcamp” in Schwangau! 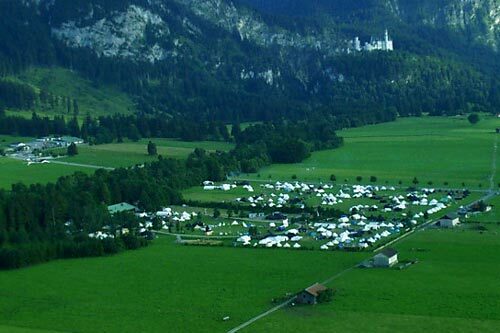 If you are planning school trips, tent camps or seminars and workshops – this is the place to be if you’re looking for economical and convenient accommodation or a campsite near famous castles and the Alps! Copyright 2019 • Gemeinnütziger Zeltlagerplatz- und Jugendheimverein e.V. All rights reserved.